Which is the best substrate for planted tank depends on a lot of things. The most important thing to think about is the health of your plants and any other fish or shrimp in the tank. We researched a wide range of substrates, including some popular brands and best-selling new ones, and put together this review to help you figure out what’s what. First, let’s look at the key features you need to know before you start shopping. Type: This refers to the texture of the substrate. There are 3 different kinds available: soil, gravel, and sand. Note that soil doesn’t necessarily mean it looks like, you know, planting soil. Often, it’s small, round granules. Trace Elements: Trace elements are micronutrients that give your plants the extra kick to thrive. Some trace elements include copper, boron, zinc, manganese, and molybdenum, all of which are essential for plants. pH: This is a scale that shows how acidic, neutral, or basic something is. It ranges from 0 to 14 with 0 being the most acidic, 14 the most basic. Tank water should be pretty neutral, around 6 or 7. Organic: A lot of these substrates have natural ingredients. Some even use a few organic ones, too. But if you’re looking for a substrate that’s purely organic, never fear. We did find a great product for you. Suitable for Shrimp: This goes back to the pH. Shrimp can’t thrive in water that is too acidic or too basic. They do best with a pH of 6.5 to 8. They also need some nutrients and places to hide. Weight: These products come in a really wide range of sizes. The largest bags give you roughly 20 pounds of substrate while the smallest is only 1.8 pounds. Keep this in mind when you’re weighing the price options. Now that you know a little bit more about the important things to look for, let’s jump right into our substrate reviews. If you don’t have a lot of time, check out our top and budget picks first. They’re numbers 1 and 2 on the list and give you an idea of what you can expect. Make sure to stick around until the end if you can, though. All of these products are really awesome. Alright, ready? Let’s jump right in. Our top spot for planted tank substrate goes to Carib Sea Aquarium Substrate. 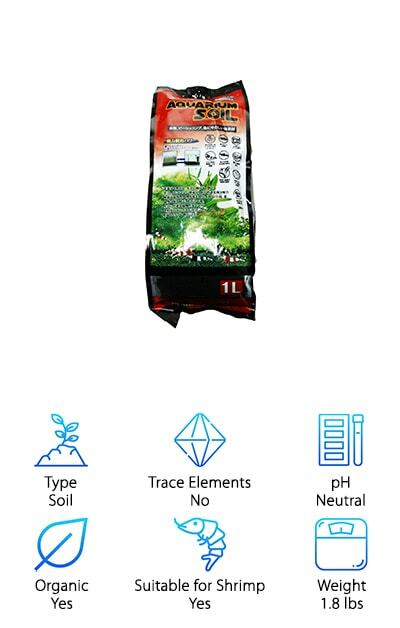 This formula is particularly awesome because it was developed to enhance the development of the roots that leads to healthier, stronger plants. How does it work? It uses volcanic soil that’s loaded with the elements your plants need to thrive: iron, calcium, magnesium, and sulfur, just to name a few. There are even live bacteria that take care of purifying the water. One of the best things about it is that it naturally keeps a biological balance which makes it super simple to cycle your aquarium. There’s more. 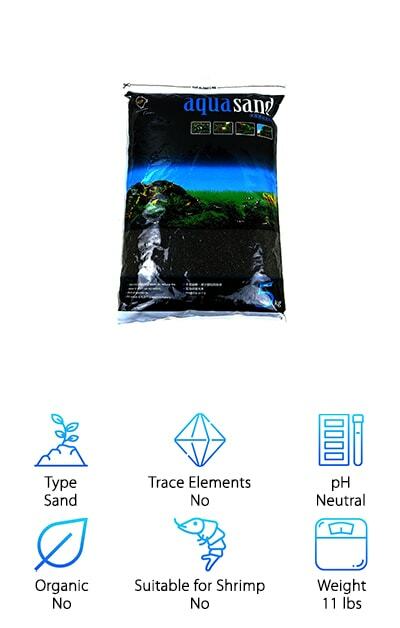 This soil contains no artificial dyes or chemicals. Its natural black color looks really awesome in your tank, too. It really makes the lush greens of your aquarium plants pop. A great substrate for freshwater planted tank is Seachem Flourite Black. As you might have guessed, this gravel is black. We actually think this is one of the best colors for substrates because it really makes vibrancy of the plants stand out. This formula was designed to provide all the essential nutrients so that the roots are healthy and will stand the test of time. 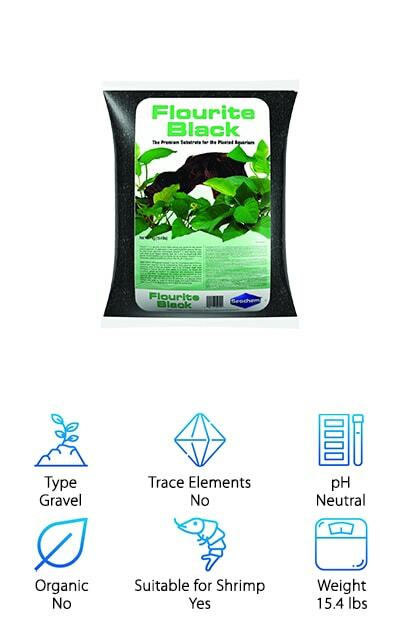 The gravel is made of porous clay that works great in a natural planted aquarium. This substrate is best by itself without other gravels or modifiers but you can mix other things in if you wanted to. One more thing, it’s not chemically treated in any way and won’t affect the pH of your tank water. This is a good option for a plants-only tank but is safe to use with fish. A great option for planted tank soil is Plant and Shrimp Stratum from Fluval. This volcanic soil is mineral rich and, as the name implies, perfect for plants or shrimp. The soft texture of this substrate makes it easy for plant roots to move throughout. You’re probably wondering why that’s important. Because it helps them access all the important nutrients they need. That’s not all. 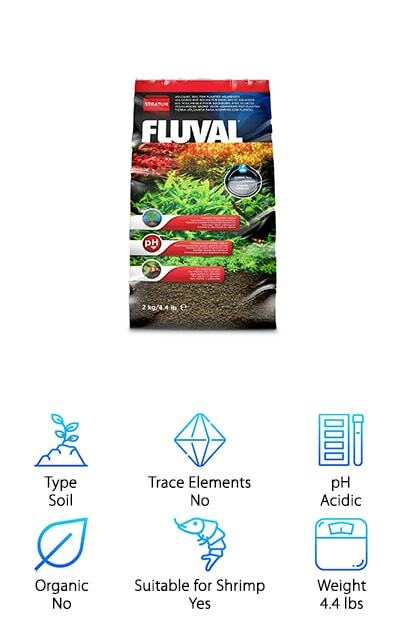 Fluval have also added special micronutrients, too. The surface of this substrate is a perfect home for beneficial bacteria that will help keep the water just right for your plants. Because this keeps the water neutral to slightly acidic, your tank will be perfect for tropical fish or shrimp. It even gives baby shrimp a place to hide until they mature enough to join the rest of the neighborhood. 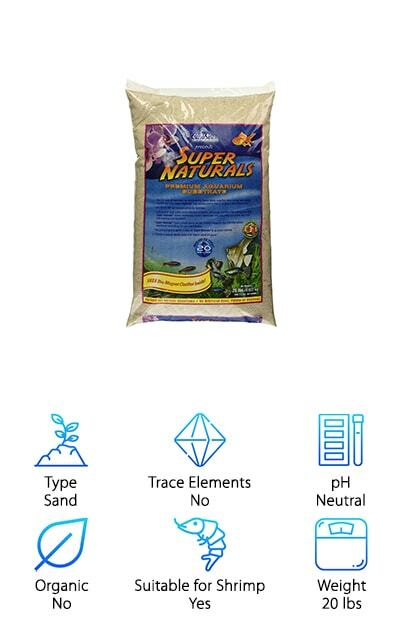 Caribsea Super Naturals Sand is a great pick if you’re looking for sand substrate for planted tank. Here’s what so cool about this one. Caribsea creates their substrates to mimic different areas of the natural world. It’s like having a little piece of a different world right in your aquarium. The crystal river variety is… well, it’s gorgeous. It looks like the white sandy beaches of an exotic getaway. But this brand is more than just looks. The grain size is specifically done so that it reduces build up. There are no paints or dyes. That’s not all, it’s also pH neutral so it’s safe for a variety of different kinds of aquariums. Your plants will get their own exotic environment while you have a little escape to the super natural right in your living room. Next up for low tech planted tank substrate is Eheim 2510051. The most awesome thing about this one is that it has an insane amount of surface area: 1800 sq ft per gallon. It’s made of artificial glass material that’s exceptionally porous. You might be wondering why that’s a good thing. One reason is that it allows water to flow through at a larger volume and with less turbulence. The other reason is that the large porous areas are the perfect place for good bacteria to thrive. What this means for you is you can go longer periods of time between any required maintenance is needed on your tank. It’s also reusable, just rinse it and you can usually get about 3 months out of it. You can even go 6 months without having to replace it! For an organic, environmentally friendly substrate check out Mr Aqua Water Plant Soil. It uses organic and inert ingredients to provide all the things your plants need. It’s a soil, too, so the texture is perfect for rooting plants that are looking for a stable place to dig in. Get this: it’s also capable of buffering and softening the water and keeps the pH in the 6.6 to 6.8 range. This is a very porous soil that lets water flow freely and easily through it. Because it’s so efficient, you can actually let it go 12 to 18 months until you have to change it. That’s pretty impressive and it saves you a lot of work. This soil is black in color and really makes your plants the star of the show. S.T. International Aqua Soil is up next in our substrate buying guide. 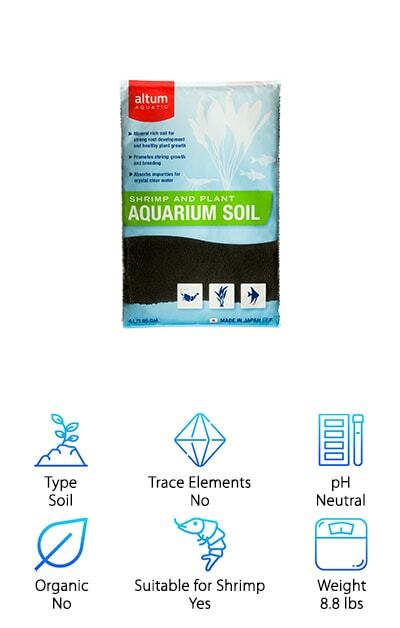 This soil substrate was designed for aquatic gardens and was specially formulated for tanks with small fish, shrimp, snails, and even crabs along with most aquatic plants. This is really simple to use. You don’t even have to wash it before you put it in your tank. The texture is not what you’d immediately think of when you hear the word “soil.” It has large grains that don’t disintegrate easily. You know what that means? It lasts for a really long time. Get this: up to a year, maybe more! Plus, it has a neutral pH of between 6.7 and 7. Plus, the black color keeps the focus where it should be: on your plants, shrimp, and fish. 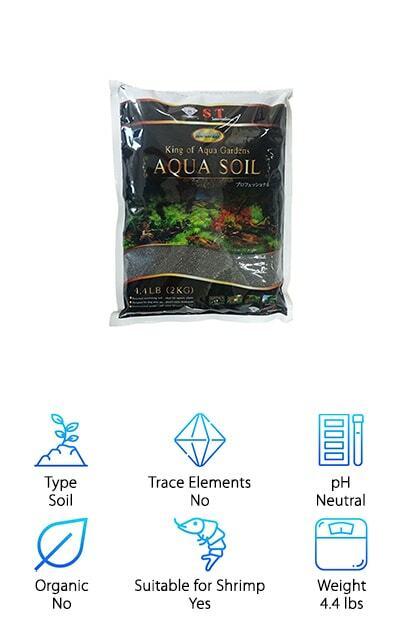 If you want a soil that will help grow strong roots and otherwise keep your plants healthy, you can’t go wrong with the mineral-rich Altum Aquatic Aquarium Soil. 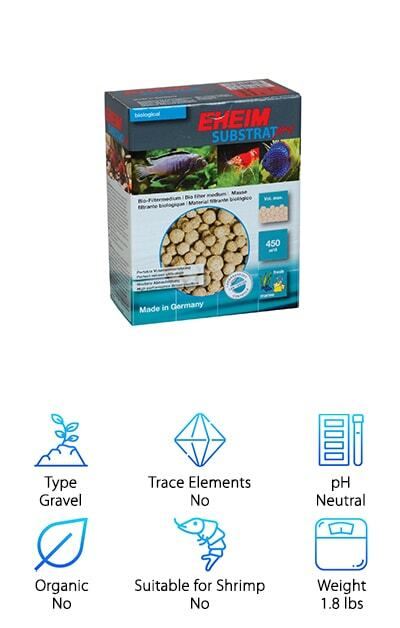 Not only is it suitable for shrimp, it actually promotes their growth and helps make the environment ideal for breeding. 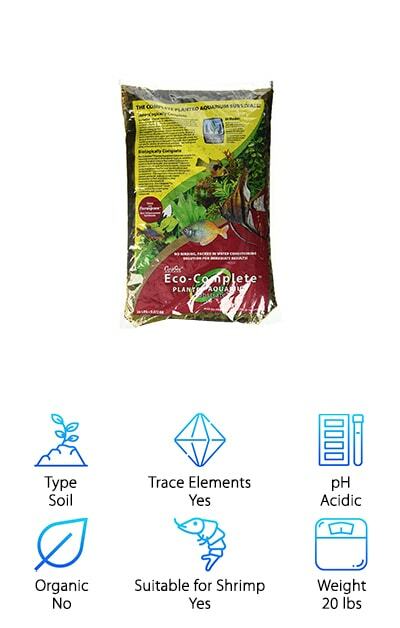 It also soaks up any impurities in the water and buffers pH to keep your plants growing strong and your shrimp thriving. This is in part because of the round, porous shape of the granules. Water or oxygen can flow pretty freely. So, what’s in it? Get this, it’s made of volcanic ash and organic soil from Japan. All of the ingredients are natural and they don’t use any dyes. The deep black color makes a good background for your featured plants and fish. Another popular product that we had to include in our planted tank substrate guide is Up Aqua Sand. You’ve probably guessed that this has a sand texture but you might be surprised by how easy it is to use. First of all, if done correctly, it doesn’t cloud the water when you’re filling your tank. (The best way to do it is to put the substrate on the bottom first and then add the water.) This substrate is really porous and easily lets water and oxygen flow throughout. Plus, it’s also very rich with nutrients but very lightweight. These things each contribute to its long life. It really lasts a lifetime without losing its effectiveness. One more thing, it buffers the pH level to keep it right at a neutral 6.5. 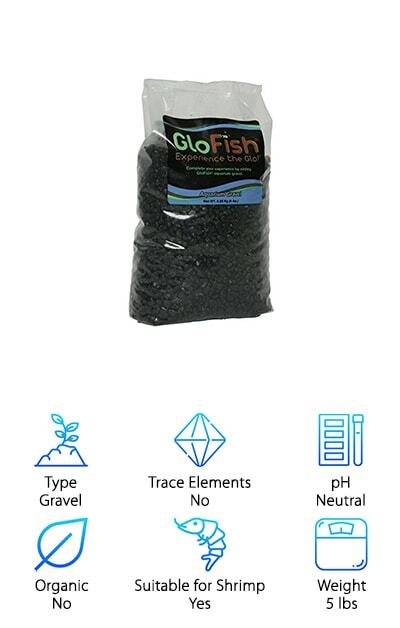 Last but certainly not least on our list is GloFish Aquarium Gravel. This product is a little different than the others on our list because it’s made for a specific tank. That said, if you have a GloFish aquarium, this is the substrate you’re looking for. You might be wondering what makes it so special. Here’s the deal: it’s specially selected to stand out under the blue light of your GloFish aquarium. This solid black option not only makes the perfect backdrop for your GloFish, it’s a great substrate, too. You might be wondering, what exactly is a GloFish? They’re fish that have been bred to detect pollutants in the environment. Scientists added a gene variant to make them glow and now that trait is passed along to all their offspring. Besides that, they’re just like normal fish.